Welcome to the June 2018 edition of KHB Ezine. Early PS: if you are reading this on a phone, turn it sideways to enable landscape view, it's easier to read. Lets talk about how to find support for yourself as an owner builder, to build your house. Now first things first: knowledge and experience in the building game will help, but can education help? Well, yes of course it can and there are many ways to upgrade your skills. From the TAFE sector, there are dozens of trade and tech courses available, some short, others year long, all valuable especially if you are lacking in building experience. There are great Cert 3 courses including plumbing, roof tiling, carpentry, bricklaying, technical engineering, building and construction, form-work, scaffolding, glass and glazing, drainage, owner builder compliance, site management, building surveying, plastering, tiling, concreting, painting and decorating, waterproofing and flooring. Any one of these will allow you to DIY or ably assist trade workers on site. And don't forget Project Management and WHS. You will find endless opinion, experience, guidance and support in your owner building pursuits when surfing the forums. Do you need to look the part on site? Are daggy t-shirts your only option? 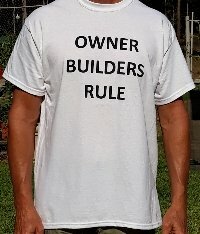 Well, I have just released these one of a kind 'Owner Builder Rules' Ts ready for you to set the on-site fashion pace. Quality Gildan brand shirts in white in both Large and XLarge. Kit home groundwork: 5 Crucial Steps. Download your free PDF version HERE and use your personal password khb4521 (lower case letters-expires in 7 days). If you miss out just contact me. I'm very happy for you to share this file and newsletter with friends and family. 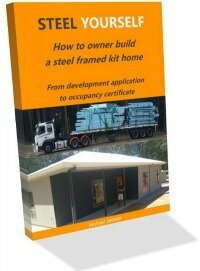 Are you looking for a fantastic full experience description of completing a steel framed kit home, from beginning to end? Steel Yourself is an ebook with excellent graphics, diagrams, submissions and material lists to assist an owner builder to navigate the journey of the owner build. I will prove to you that any owner builder can plan, submit, build and finish a steel building kithome project. Remember, if you have any questions, have an article or submission, or would like to comment on a kit home, provider or design, please contact me, I'm happy to publish your submissions, reviews and experiences about kit home building and the projects surrounding them. Follow me on Facebook here and if you like the page...please "like and follow" it!